Do you remember when the American Flag had 48 stars? Many of us do. There have been many, many different United States flags since our founding in 1776. On Monday, August 10, the North Manchester Historical Society will present the entertaining and informative video The Many Faces of Old Glory that tells about some of these flags. The video shows over 20 American flags of historic significance, and tells the stories of the events connected to each flag. The program emphasizes the early years of the United States. 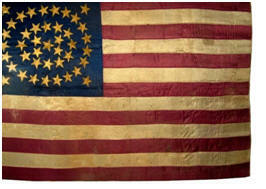 Initially, there were many different flags representing the young United States, no two alike. The project was created by Vane Scott, who co-founded the Colonial Flag Company in Coshocton, Ohio, and who became a popular speaker/entertainer on the topic. He describes his program as “How we got the flag, and how we got the United States.” Vane has also been a commercial artist, designer, and builder for national conventions, celebrations, movie premiers, and fairs. The program has been presented to schools, patriotic groups, and business conferences, and has aired on radio and television. The program will begin at 6:40 p.m. in the Assembly Room of Timbercrest Senior Living Community, 2201 East Street. There is no cost for the program, which is free to the public. All are welcome. While many attend only the program, the public is also invited to come at 6 p.m. for a meal prior to the program. For those who wish to attend the dinner, reservations must be made no later than noon on Friday, August 7. The cost of the meal is $8.50, $3.50 for those on the Timbercrest meal plan. Reservations may be made by calling Evelyn at 260-982-6777, Mary at 260-982-1813 or the Center for History at 260-982-0672.